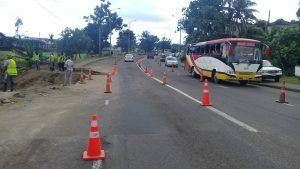 The Fiji Roads Authority (FRA) will be commencing road reinstatement work along the Ratu Mara Road in Nabua from tomorrow (March 29). This was after the Water Authority of Fiji (WAF) carried out some urgent repairs on the Nabua Sewer Trunk last week. Water Authority of Fiji Chief Executive Officer, Mr Opetaia Ravai said crew members started repair works on Sunday (19/03) and was completed on Wednesday afternoon (22/03). “A total of twenty-eight crew members were engaged in the repair works. The pipe works had to be done to avoid a potential sewer crisis from occurring. This costed us approximately $104,000, and it saw the repair of 5.4 metres of 750mm pipe at a depth of four metres,” said Mr Ravai. The leakage was identified during the joint walk over with the FRA and the China Railway First Group. FRA Chief Executive Officer John Hutchinson says, although the sewer repair works are complete, the associated road works will take a little longer. Mr Hutchinson has urged motorists to adhere to the speed limit and drive with extra care and attention whilst these important works are undertaken. Work to backfill the excavation will commence tomorrow and is expected to complete before Easter, weather permitting.